Part ‘One Flew Over the Cuckoo’s Nest’, part ‘The Breakfast Club’, Desiree Akhavan’s LGBT drama has power and compassion in spades. Desiree Akhavan follows up 2014’s lovely ‘Appropriate Behaviour’ with a tender and gently comic drama about a lesbian teenager dealing with society’s disapproval. Part ‘One Flew Over the Cuckoo’s Nest’, part John Hughes film, it packs an emotional punch and a career-best performance from Chloë Grace Moretz. Opening in 1993, Moretz is Cameron, a high-schooler having a secret affair with her friend Coley (Quinn Shephard). When the pair are discovered in the back of Cameron’s boyfriend’s car on prom night, they are greeted by onlookers with unadulterated horror. She’s whisked off to an evangelical Christian camp in the wilds of Montana to be ‘cured’ of her homosexuality. The place is ruled over by the menacing Dr Marsh (Jennifer Ehle), who bullies her subjects into reaching twisted conclusions about their sexuality. 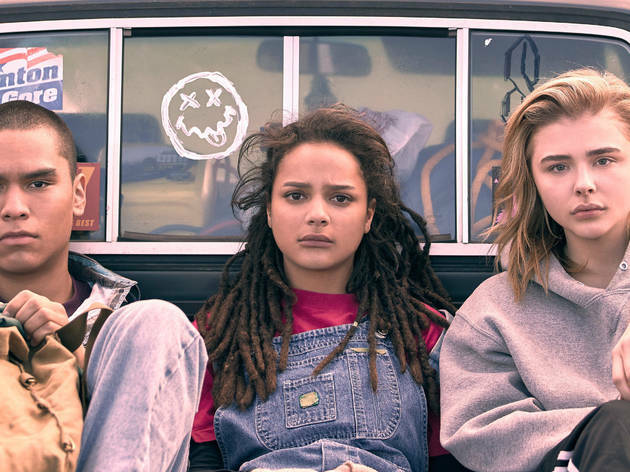 Her methods amount to psychological torture but Cameron’s like-minded camp-mates – ‘Navajo two-spirit’ Adam (Forrest Goodluck) and a weed-puffing girl nicknamed ‘Jane Fonda (Sasha Lane) – teach her how to navigate her bullying. From these unlikely raw materials, Akhavan has crafted a compelling, funny drama that charts the confusion of adolescence and the importance of facing down its challenges. It’s a film that wears its giant heart on its sleeve, inviting you to bask in the happiness that comes with accepting who you are. Is there a better message than that? Simply loved this film. Caught it in a mostly empty suburban cinema on a Sunday night. Spontaneous purchase. Sat back - relaxed , and was bowled over. A searing attack on Christian do-gooders doing damage - and a beautiful portrayal of intelligence winning over righteousness in the area of sexual realignment.